NewsWeek report about a startling discovery in Turkey that reshapes what we know about prehistoric man. 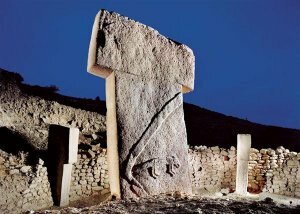 Archeologists are unearthing Gobekli Tepe near Sanliurfa, Turkey, a temple complex estimated to have been built 11,500 years ago, a staggering 7,000 years before the Great Pyramid. The ruins are so early that they overthrow the consensus of archeology, and may imply that it was the urge to worship that brought mankind together in the very first urban conglomerations. More info at NewsWeek.